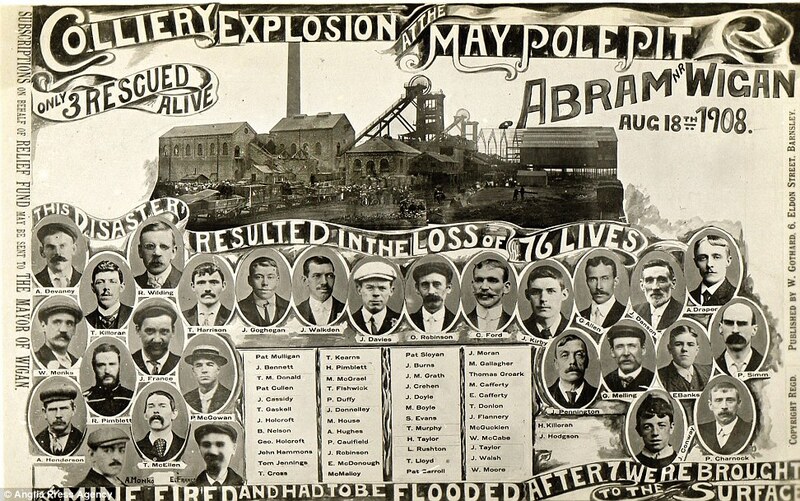 For more Maypole and other colliery picture post cards click here. SEVENTY-SIX candles were lit at a ceremony in Co Mayo yesterday in memory of all those who perished in the 1908 Maypole tragedy, one of Britain's worst mining disasters. Among those who gathered at Hennigan's Heritage Farm, Killasser, Swinford, to commemorate long-lost ancestors was Winifred (Freddie) Neighbour from Kent. 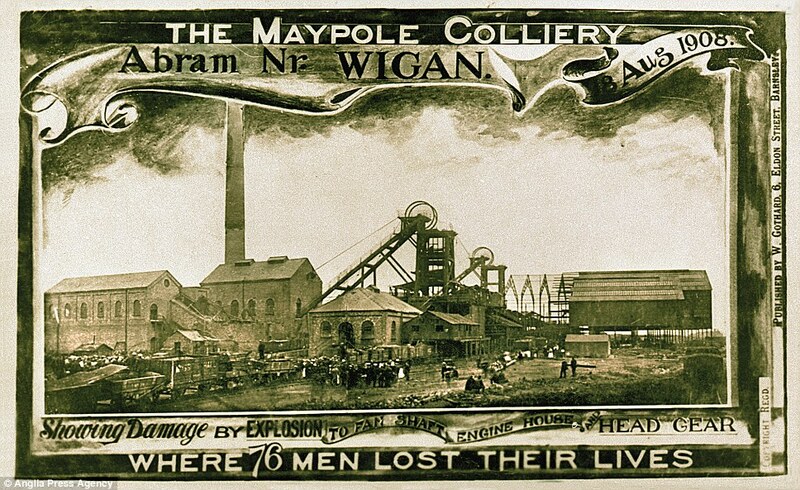 Her maternal grandfather Thomas Groarke, from Charlestown, was one of the many Irish who died in August 1908 when an explosion ripped through the Maypole colliery in Wigan, Lancashire. Another to perish was Anthony McDonagh from Treenagleragh, Kiltimagh. His grandson, Anthony McDonagh, recalled that the tragedy had "turned women into widows, robbed children of fathers, and sisters of brothers". As a result of the disaster his grandfather had never seen the son named after him, Anthony recalled with a tear in his eye. 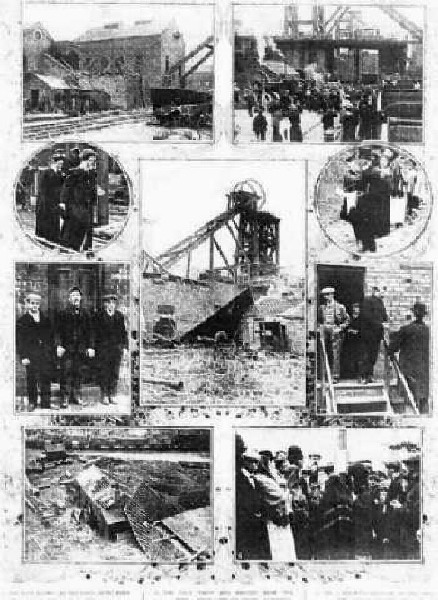 Only three miners survived the blast, one of whom was Edward Farrell. Until the day he died he was reluctant to tell the tale of what happened. Yesterday's ceremonies, which were held to coincide with the Mayo Emigrants' Reunion, were attended by mayor of Wigan Rona Winkworth and cathaoirleach of Mayo County Council Joe Mellett. A room at Hennigan's Heritage Museum has been dedicated to the Maypole tragedy. Old mining equipment is on display, as well as a tapestry with a roll-call of the dead embroidered by a descendant of one of the victims, along with the original Maypole flag which flew over the colliery. Just after 5 o’clock on a sultry August afternoon, Mr. Arthur Rushton, the manager of the Maypole Colliery in Ahram, returned home from a ten days’ holiday. As he put the key in the lock, a dull rumble caused him to look over his shoulder. What he saw was the start of a night-mare that stayed with him for the rest of his life. A black cloud of smoke was pouring, with great force, out of the pit shaft. When he arrived at the pit head, he found the engine house was a tangle of roof timbers and bricks, the headgear blown away and the cage lying at the hottom of the shaft. Soot and debris were scattered over a wide area. Buildings over a mile away had been shaken by the blast and a dense cloud of black smoke and poisonous vapours rose from the shaft for many hours. Realising the grave situation of the men below ground, Mr. Rushton and other officials planned rapid and desperate attempts at rescue. Half a mile away was the headgear of the Wigan Junction Colliery and from there, underground, went a tunnel to the workings of the Maypole. The rescuers proceeded along this tunnel, penetrating the Maypole workings and brought out three men alive and uninjured. Advancing further, they met ‘afterdamp', and exploration became very difficult. The roadways were filled with a mixture of smoke and afterdamp and although strenuous efforts were made to clear it, it resisted all their skill and bravery and stood like a wall, preventing further advance. In spite of the appalling conditions, seven bodies were located, and fourteen others seen, but in positions that made their removal impossible. afterdamp. The seven were taken along the tunnel to Wigan Junction and up to the surface 800 yards above. These men had survived the force of the explosion, but had succumbed to the effects of the afterdamp. escaped with their lives as they were pursued along the tunnels to the cage at Wigan Junction by an oily cloud of black smoke. After this it was clear that a large part of the mine was on fire, thick acrid fumes belching up out of the once downcast shaft. This put an end to rescue attempts and a roll call showed that sixty-eight men remained half a mile below the surface of the earth and without question were already dead. It soon became apparent that there was no hope of dealing with the fire except by flooding the pit. Representatives of the workmen, the owners and the Home Office agreed that this course should be adopted. Over 100 million gallons of water were poured down the shafts during the succeeding weeks. During this time violent explosions, some almost as great as the original one, were experienced. A fund was opened and an immediate donation of £100 arrived from His Majesty the King. Contributions came from near and far - the coppers of the unemployed and the gifts from the wealthy and from industrial concerns. In September, a resumed inquest heard that, until the mine was cleared and the cause of the explosion determined, there could be only a formal identification of bodies but because it would be some months before this could be done, the coroner decided to hear what evidence there was. All the witnesses agreed that the tragedy was the result of an ignition of gas and His Majesty’s Inspector of Mines, Mr. Hall, outlined the likeliest causes of this, the most obvious being a blown-out shot, or a defective lamp. It was suggested that the explosion was aggravated by coal dust in dirty roads and that pockets of gas in the cavities of old or abandoned workings were ignited by a shot penetrating these cavities, the shot-firer being unaware of their existence. Letters were received from throughout the country, some condemned owners for making men work in dangerous areas, others, condemned the Miners’ Lodges for ignoring complaints allegedly made by men at the Maypole and several letters blamed the safety lamp - the Marsaut. “After some years,” said one correspondent, “the threads in the base fitment wear, allowing gas to travel along the threads,”. Corrosion of the pillars supporting the glass, and thus destroying the air-tight fit was also offerred as a possible cause of failure. Witnesses agreed that the so-called “permitted” explosives were only safe if used under certain specified conditions, but there was disagreement about the value of damping with water to keep down coal dust about the heat in certain working places and about the correctness of, and notice taken of, the firemen’s report - it was clear from the evidence that the reports were rarely compared. The surviving firemen were questioned very closely and were found to hold differing views as to the quantities of gas found, especially in a large cavity in the roof caused by a fall some time earlier. The movement of people and tubs could clear small pockets of gas away these were therefore not always reported because an hour later the gas was cleared. Some men assured the court that the gas was so strong near the workings face that their lamps had to be “put back” into a clearer area. Some men had their drawers, or helpers, “fanning” them with a shirt and others claimed that they frequently went away to clear their heads in cleaner air. All these claims were denied by others. There were no records of complaints made at the Lodge meetings and no use was made of Rule 38, by which two men could be appointed to examine working conditions on the miners’ behalf. The court had to decide - were some men working bad areas because the money was good, and ignoring safety rules? Some places were so easy to work that, as one man put it “You could kick the coal out with your clogs.” The main complaint was that there were not enough empty tubs and since a man made his money on the amount he cut, waiting for tubs meant a loss of income. One witness said he made an average of £2.5s. 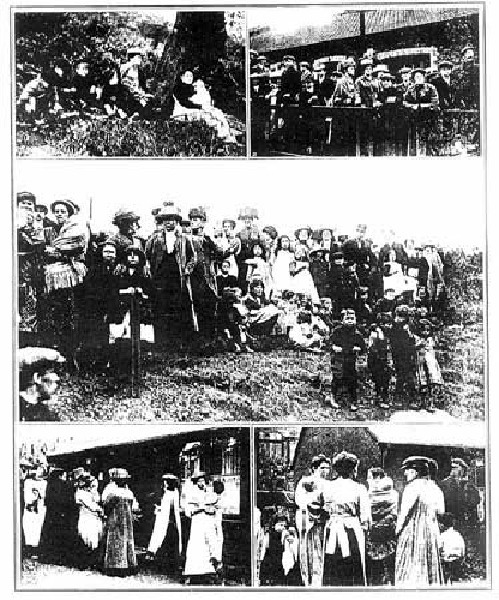 (£2.25) a week, which was enough to keep a man and his family in reasonable comfort. There were frequent brushes between the coroner and Mr. Walsh who represented the Miners’ Lodge. He was rebuked many times for repeating questions which the coroner felt had been satisfactorily answered already, and for wasting the court’s time. Mr. Walsh accused the coroner of deliberately silencing him. The Mines’ Inspector, gave the mine and its managers a good report. The reports he had seen from the firemen were adequate and he classed it as a clean, well-run pit, a bit “firey” but easy to work. He would not give an opinion as to the cause - no-one could until the pit was explored, and then the job would be difficult because of the flooding. 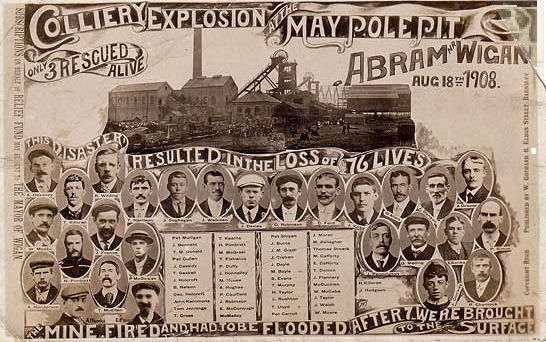 The men died from an explosion caused by a mixture of coal dust and gas, fired by a shot using a permitted explosive and into which too much trust was placed. The supervision during the manager’s absence was slack. It appears that due precaution had not previously been taken by some of the men whose lives had been lost. That it was possible that some of the men may have been willing to work, in dangerous conditions in order to make ‘easy’ money. Firemen should not be expected to fire shots as well, but there should always be a man doing the job exclusively. There should be more mines’ inspectors. There should be a rule limiting the number of people down a pit when shots are fired. Floors should be swept as well as watered to keep down the dust. The coroner on dismissing the jury, recalled the tragic stories brought out by witnesses. Boys found clinging to fathers’ legs, men with cloth over their faces and open tea cans as they vainly tried to combat the sulphurous fumes. Families in which all the men folk had been wiped out. The fearlessness of men who spoke out even though they feared it would blacklist them by either collier or Company. Above all, the shadow lasting longer than the fumes below, that lay over the whole community from the day, eleven months earlier when the Maypole “went up”. Seventy five men and boys lost their lives in the disaster. The postcard published by W Gothard of Barnsley quotes 76 as the toll, but prints 77 names. Fortunately two of those listed had not been killed that day. Only seven bodies were recovered, the remains of the other 68 being still underground. In the list below, the first names are my best transcription of the 77 name on the postcard. They are followed in block capitals by names I have verified by other means, in particular from the memorial in the churchyard.